Here is our winter talks programme for the coming season. All talks will be held at the Scottish Association for Marine Science (SAMS), Dunbeg. Doors open at 7.15pm and talks start at 7.30. Thursday February 15th 2018 Pippa Garrard Tales from on board the ‘Silurian’ that changed the Trust forever! Thursday March 15th 2018 Mary-Anne Collis Saving Scotland's Red Squirrels. All talks are held at the Scottish Association for Marine Science, Dunstaffnage, beginning at 19.30. All welcome. There is a small charge for members and non-members to cover our costs. 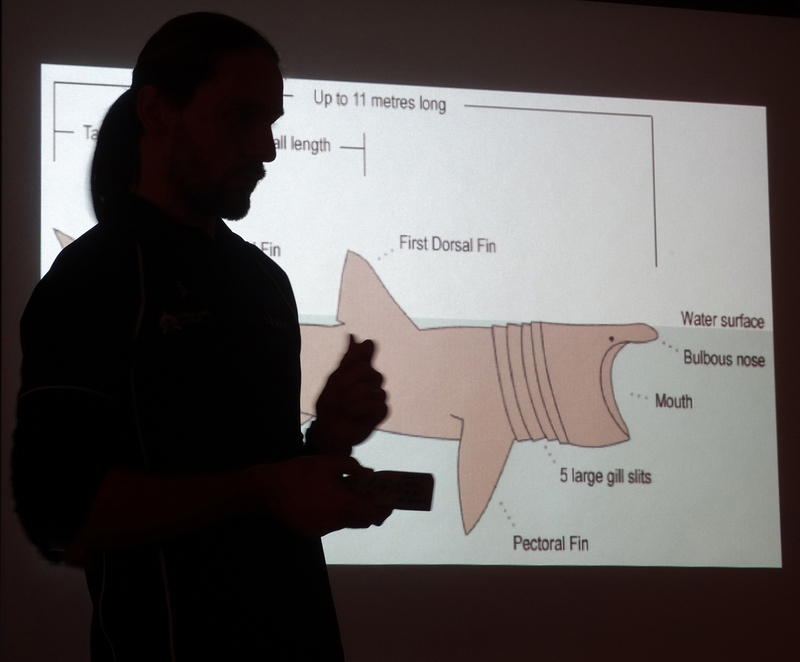 Our last evening lecturer before Christmas was Shane Wasik, of Basking Shark Scotland, a company who operate boats out of Oban during the summer season. Shane spoke on ‘Interactions with Basking Sharks’ and told us that apart from giving visitors the opportunity of swimming with basking sharks, the second biggest fish in the world, BSS also photographed these gentle plankton-eating giants and collected data on their movements – there are many aspects of their lives still unrecorded. He spoke about the group’s photographing for the first time smaller fish accompanying them, much as pilot fish do with other sharks. These proved to be a fish native to the Canary Islands. The photography was excellent, in particular the high quality video taken from above by photographic drone, and listeners learnt a great deal about this elusive creature. His photographs included other species such as the sunfish, the heaviest bony fish in the world, which is occasionally seen in Scottish waters, maybe riding in on ‘offshoots’ of the North Atlantic Drift. A thoroughly enjoyable and informative talk.